We had a great Christmas celebration 2015! Everyone super enjoyed. It was an event filled with excitement and sharing. Last year we made Christmas bags to carry the treats. This Christmas we decided to make Christmas trees. 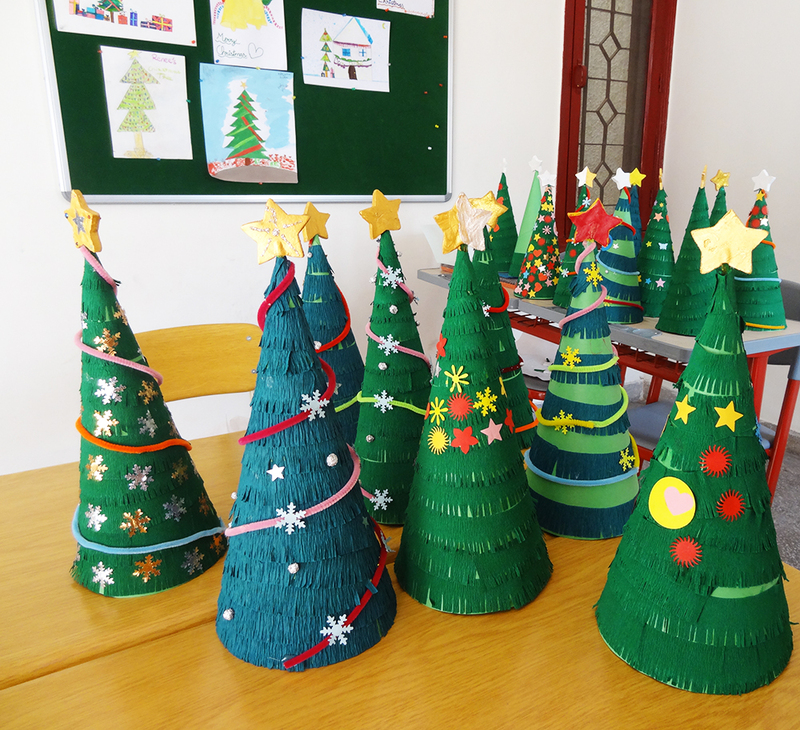 To complete the activity on time for the celebration, I gave every child a green cone shaped tree to decorate. We used A3 sized green card stock, long strips of green crepe paper, pipe cleaners, cutouts using pattern punches, reused foil, air-dry clay for stars on top, metallic acrylic paints, glue gun and pva glue. The stars were made in a lollipop style with a piece of pipe cleaner attached to them before drying, so the stars could be removed easily from the tree. We are yet to review the other gifts received along with the trees. Most of them found a book as well and I am looking forward to begin our book sharing, reading and artworks there after. By my introspection, it is going to be another long and inspiring journey of activities with all my students - more smiles, fun discussions and lots and lots of artworks!! Thanks for reading and visiting. Enjoy a grand new year of creativity and joy!